I've already admitted to liking my fair share of crappy food. I eat junk food and go to McDonald's sometimes. Yeah, I said it! But I also try to incorporate organic products when possible and when (I think) it really matters. I follow the "Dirty Dozen" list, for example. Even when I don't buy organic, I at least prefer to get food that is actually food. These preferences can result in higher food costs. Higher than exclusive Whole Foods shoppers' bills? No, but definitely higher than my frugal boo would like. Boo prefers shopping at places like Superior Grocers, a local chain with super low produce prices and several lines of crap, er, products that are also super low in price. In my opinion, some of these things are actually overpriced because they aren't really even food. 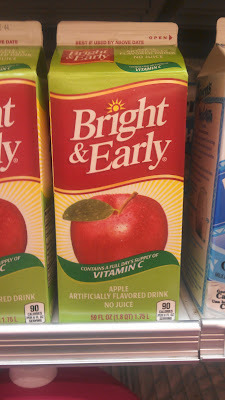 CONTAINS NO JUICE. NONE. APPLE ARTIFICIALLY FLAVORED DRINK! Line your kids up, everybody! We've got apple flavored drink for sale!